Do you love oatmeal? Do you love pancakes? You should try them when they are one and the same. The oatmeal pancakes provide an extended source of energy.These pancakes are made by adding oats to wheat flour, as oats are highly nutritious and filled with cholesterol-fighting soluble fibre. Being extremely satiating, they prevent you from bingeing on junk food. 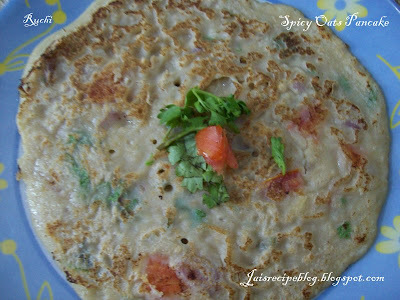 Serve these pancakes hot, along with mint and coriander chutney. I adapted this recipe from Tarladalal's Recipe Book. 1. Mix together all the ingredients in a bowl and add enough water to make a thick batter. 2. Grease and heat a non-stick tava (griddle). 3. Spread a layer of the batter to form a pancake of 4 mm. thickness. 4. Cook on both sides till golden brown, using a little oil. 5. Repeat to make 3 more pancakes. 6. Serve hot with the coriander chutney. Very healthy pancakes. A good way to introduce oats. Do find time to drop by, I understand every one's busy, so whenever u get time. Healthy and yummy pancakes. White millet flour is kambhu mavu right. One more recipe for eve snacks for my kids. Come and accept a giant bear hug in my blog. I love oats,so got to try this one,sounds too healthy,will sure enjoy! 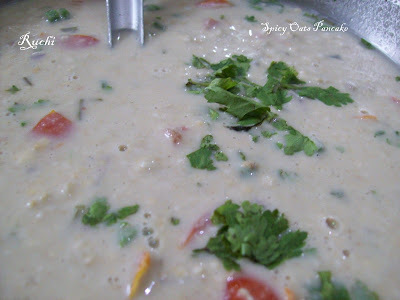 Healthy and yummy recipe dear...will definitely try...thanks 4 sharing! woo wow nice and healthy recipe great idea. Lovely pancakes, and healthy too..